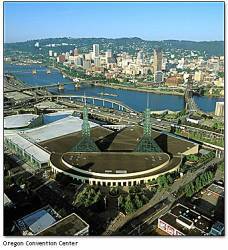 The 2010 Institute of Navigation GNSS conference will take place at the Oregon Convention Center in Portland, Oregon from Tuesday evening, September 21 through Friday morning, September 24. Paper abstracts are due on Friday, March 12 2010. Submit them online at the ION website. This year and next, ION GNSS takes place right in Inside GNSS‘s home territory! (Portland lives up to its reputation for food, wine, performance art, outdoor delights and creativity – we’ll be posting links to some of its finer attractions as the year goes on.). The three-day event will cover program updates of the world’s global navigation satellite systems and technological developments in all areas of space-based positioning, navigation and timing and related systems. This year, the conference’s general chair is Naser El-Sheimy, University of Calgary and the program chair is Patricia Doherty, Boston College. The conference headquarters hotel is Hilton Portland & Executive Tower, 921 SW Sixth Ave.